November 13, 2018 by Ecommerce News. About Consumer behavior with tags The United Kingdom. 3373 views. The ecommerce website of DIY retailer Homebase has finished last in an annual online shops survey. Many customers in the United Kingdom weren’t satisfied with their online shopping experience at Homebase.co.uk over the past six months. Every year, Which, a consumer information platform from the Consumers’ Association, surveys over 10,000 members to ask them about their online shopping experiences over the half year prior to the survey. For each retailer they had shopped with, consumers tell how satisfied there are with their experience and whether or not they would recommend this retailers to a friend. This year, Homebase has the worst online shopping experience in the United Kingdom. The DIY retailer only got a 55 percent customer score, thanks to consumers who think the website is difficult to navigate and doesn’t always give them up-to-date information. Dorothy Perkins and Sports Direct didn’t perform much better, as they scored a 61 percent customer score. A spokesman of Homebase has said that customer feedback is really important to the company and that it’s working hard to make changes online, so it can provide great service when customers shop with them. Maybe Homebase can take some notes while visiting the ecommerce websites of smaller brands, as they seem to do better in the rankings. For example, beauty brand Liz Early ranked first with a 94 percent customer score. And sound specialists Richer Sounds and clothing retailers Rohan and Seasalt Cornwall also did well, with a 93 percent score. 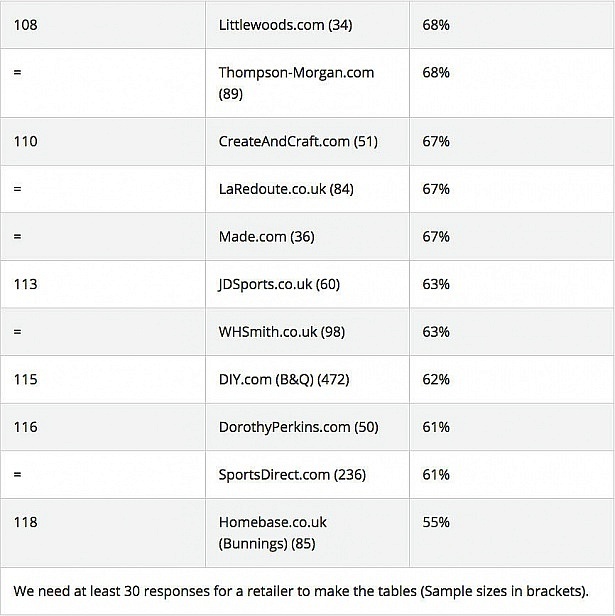 Worst online retailers in the UK, according to a Which survey.